In October 1941 an eight-year old boy, Rodion Shchedrin, went to the window of his flat in Mitnaya Street, Moscow. He could smell burning, and was surprised to see charred scraps of paper floating up from the building opposite. The building was the Goznak works, home of the official producers of banknotes and postage stamps. Rodion watched as they incinerated the contents of their safes. Moscow had been under threat since Operation Barbarossa, the Nazi invasion, began on June 22nd 1941. By October many heavy industry factories had been transplanted in their entirety towards safety in the Urals. 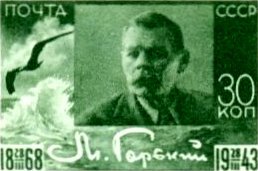 It is fairly safe to assume that the printing, manufacturing and distribution of Soviet postage stamps went with them, although the small detail above (from Shchedrin’s autobiography) is the closest this writer has come to establishing what happened – unsurprisingly Goznak today is coy about its exact movements at a time when desperate flight was the order of the day. Of course, the Soviet military machine had already been in action. Two years earlier it had marched unimpeded towards Poland, taking the opportunity in doing so of cementing control over areas of the USSR which still harboured fierce hatred at Stalin’s Holodomor – the deliberate starving to death of millions of Ukrainians so that Russia might export grain to finance massive industrial expansion. 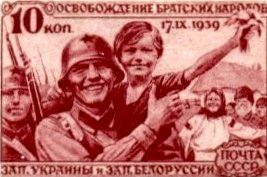 Within six months a set of stamps appeared featuring the joyful inhabitants of that area welcoming the Red Army, come to relieve them of the pernicious influence of neighbouring Poland. Ivan Ivanovich Dubasov, newly-returned after a five year absence, had his first real opportunity to dispel any lingering notions of counter-revolutionary modernism to which his more adventurous designs may have given rise. It also established a style that was to serve him well in the years of the Great Patriotic War – a ‘social realism’ based on actual photographs or on suitably dramatic artistic reconstructions. 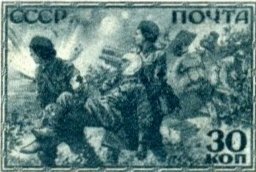 The propagandist value of these particular images reaches even to the catalogue compilers at Stanley Gibbons, who have always claimed them as depicting the ‘occupation of Eastern Poland’. The British may look at it that way, but what the Russian words say is ‘liberation of the brotherly peoples of western Ukraine and western Belarus’. Almost, but perhaps not quite, the same thing. The next military adventure was less straightforward. It resulted in some sharp shocks for the Red Army after its ignominious tussle with the Finns in what became known as the ‘Winter War’. 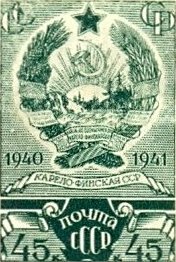 The exposure of military frailty (not to mention the ruthless expulsion of the entire Karelian population of eastern Finland from their homeland) was naturally forgotten when, a year later, Dubasov offered a traditional design to mark the anniversary of the resultant Karelo-Finnish Republic. There’s a hint of Scandinavian forest in there, but smiling soldiers and grateful peasants are notable for their absence. 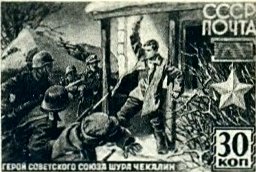 The success of this incursion nevertheless concealed profound weaknesses in the Red Army’s organisation. When the German panzer divisions rolled across the Vistula on June 22nd 1941, the Soviet high command (who had chosen to ignore several warnings) was so taken by surprise that huge areas of Russia were lost within days and the country placed on immediate emergency footing. 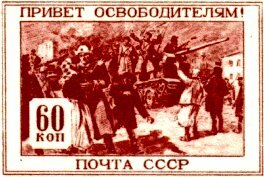 Back in Moscow, now threatened, conventional stamp issues featuring the painter Surikov, the writer Lermontov, and the Lenin Museum (the latter two by Dubasov) would have been in preparation well before then, but now stamp production virtually ceased. 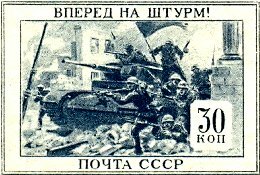 Along with the munitions factories, the tank and plane builders, the research and development laboratories and who knows what else, Goznak was on the move, ensuring its banknotes and coins and medals were produced a thousand miles to the east, safe from the impending onslaught. A single stamp exhorting people to “Be a hero!” was rushed out in August. 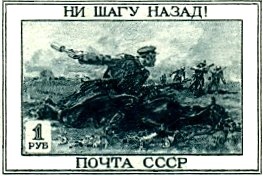 By December Dubasov had designed a similar stamp (left) insisting that “At the call of the Great Leader Comrade Stalin, the sons of the people of the Soviet fatherland join the People’s Militia”. January saw his design celebrating a medieval Central Asian mystic – it may well have been prepared before June 22nd – and that was it. 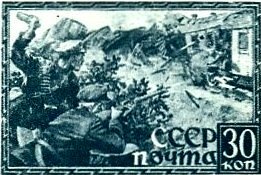 Between the invasion and the resumption of serious propagandist issues eighteen months later in November 1942, Goznak issued just four stamps. What instructions (if any) the People’s Commissar for Communications, Ivan Peresypkin, was given by the hard-pressed GKO (the State Committee for the Defence of the USSR); what orders he passed down to Goznak’s Head Artist; what personnel had to relocate from Moscow to Kazan, or Perm, or distant Sverdlovsk; what importance anyone attached to postage stamps while the massive industrial recovery which ultimately sealed the invader’s fate was grinding into action – these questions can only be asked here, and perhaps they cannot now be answered. 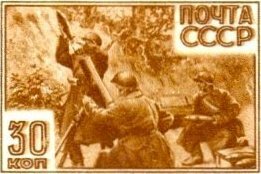 Let us imagine instead, for we know the result, that during the months of 1942 a stamp-issuing policy was formulated, carried out by Ivan Dubasov and his team of artists, and produced and distributed far from the battlegrounds of Operation Barbarossa. 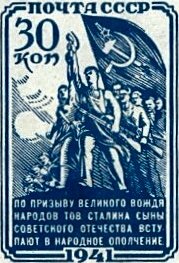 For civilians the ten sets of stamps in the year following November 1942 – a year that effectively saw a decisive turn of the tide in Russia’s favour – included seven that were unashamed propaganda, designed to inspire with a mixture of heroism, tragedy, and determined solidarity against the foe. 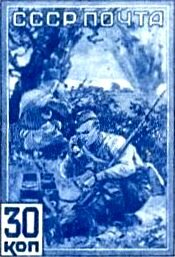 Dubasov himself illustrated the pitiful tales of Shura Chekalin and Zoya Kosmodemyanskaya, both captured, subjected to dreadful treatment and executed by the Germans after acts of desperate bravery. Dubasov’s designs are heavily peopled, emotionally charged, full of action. When they are not illustrating actual scenes, they imagine typical military activity: partisans attacking a derailed train, nurses carrying a wounded soldier from a battle, a three-man bazooka section, entrenched infantry resisting oncoming panzers. These images excite and inspire – as much as anything else they are a recruiting tool for youngsters, and foreshadow innumerable illustrations in post-war adventure books and comics for boys. In these designs – Dubasov by now had a team of artists producing similar material – words and numerals are tucked away in corners, borders narrowed and slogans kept to a minimum. The narrative image is all. Throughout the summer of 1942, when these issues were presumably planned and designed, the Soviet military machine was frantically re-arming, while German troops moved inexorably towards the precious oilfields of the Caucasus. Leningrad was ruthlessly besieged and Moscow permanently threatened. 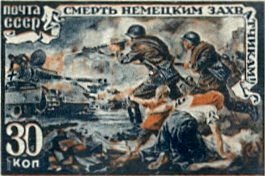 In September, von Paulus’s Sixth Army arrived at Stalingrad on the Volga, with direct orders to take the city – the jewel in the crown, as Hitler saw it, to be seized at all costs because it was literally Stalin’s city, and the key to victory in the south. 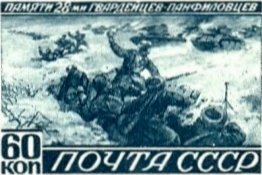 Those inhabitants of Stalingrad who chose or were force d to stay while the four-month battle for its future raged were unlikely, one imagines, to appreciate the simultaneous issues later designated as ‘War Episodes’, one in photo-gravure, the other typographed, and appearing piecemeal while the fate of the Soviet Union was in the balance. Eight of the ten stamps incorporated dutiful slogans such as “Death to the German Invader!” or “All for the Front! All for Victory!” For some reason, whether by happenstance or by choice, the two that did not were by the Head Artist himself. His designs are notable for their similar visual structure, and for the sense of depth they achieve: the signallers (left) calling in the artillery fire seen in the distance, and the partisans (above right) attacking a derailed train. like a streak of sable lightning. in the bird's courageous crying. of his passion, of his anger, / of his confidence in triumph. Forty years on, it was the passion, the anger, the confidence in triumph, as much as the men and matériel, that did for the Germans in 1943 and 1944. Ivan Dubasov must have been a lover of literature – in years to come he would repeatedly choose literary anniversaries for his own designs. A favourite was the remarkable Vladimir Mayakovsky – poet, playwright, artist, designer, actor, director and even film star. Such wide-ranging talent, in one so young, attracted not just the admiration of many intellectuals, but also the interest of men who liked neither his bourgeois avant-gardism nor more importantly his propensity for criticising the Bolshevik state. In 1930, at the age of 36, Mayakovsky was found dead, shot through the heart. It was given out that he had committed suicide. So far, so patriotic and unexceptional. And yet... we remember Dubasov’s early designs, with their echoes of avant-garde Russian art, and his unexplained absence for five years in the 1930s. Is there a hint of sympathy for the rebel in Dubasov's design? The title of the poem from which these words are taken translates as ‘Slogan Rhymes’, which aptly describes its disjointed, short, sharp lines – a list of slogans indeed, to be read with what - unquestioning approval? Or something more ironic? 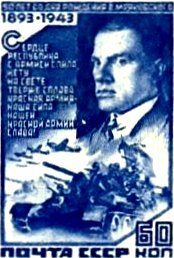 The sardonic, sideways look the poet gives us in the chosen portrait seems to ask, “Do you really believe in this?” No doubt Dubasov welcomed the Red Army’s triumphs as much as any Russian, but you may think that this was not all he was doing in the Mayakovsky design. Dubasov’s team of artists during the exile from Moscow – whether they worked in-house or from home – was different from those he had used before the German invasion. There were sixteen in all, only one of whom had designed prior to 1941. 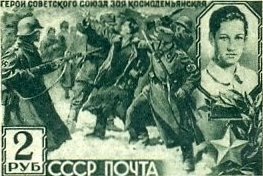 Work must have been hectic or conditions in some way prohibitive to require that number of men, but Soviet success at the Front eventually eased the load. From the beginning of 1944 Dubasov retained only three designers for the eighteen remaining wartime sets. In the final part of this article, a more settled period at Goznak sees Dubasov return to some of his favourite subjects before easing gradually into a well-earned retirement.